It was clear to all that easy answers would be highly elusive, and that in all likelihood the question would remain unanswerable, at least objectively. This premise was both disquieting and inspiring—and led to further questions: Could a compelling exhibition be created around such a complex subject? How would visitors access and navigate the intricate histories and as-yet indeterminate impacts of future technologies? How can we explain and visualize democracy? The answers to these questions required the invention of a highly participatory experience in which the visitors themselves would play an essential role in exploring the premise—by engaging in dialogue with other visitors, exploring their ideas and emotions, debating the facts, and collectively deciding an outcome. Rather than explain democracy, the exhibit development team needed to create a place where democracy itself could be enacted. The basis of the exhibition was two-fold. Celebrating the museum’s 100th birthday, the exhibit puts the focus on the museum’s amazing collections, showcasing their depth. 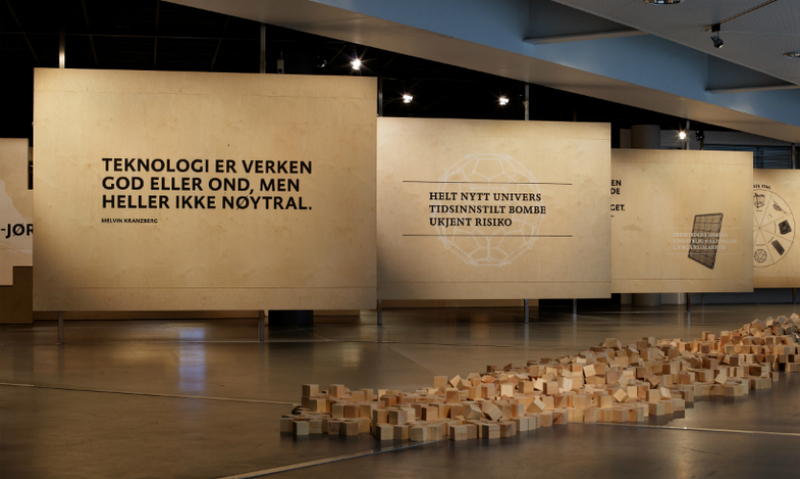 At the same time, it celebrates the 200th anniversary of the Norwegian constitution of 1814, stressing the museum’s role as a democratic institution where visitors actively participate in a TING session. Eight controversial objects are put up for discussion and voting at the Ting. Each one of these revolutionary technologies is introduced with a short film narratively illustrating the object’s past, current, and possible future impacts on democracy and society. 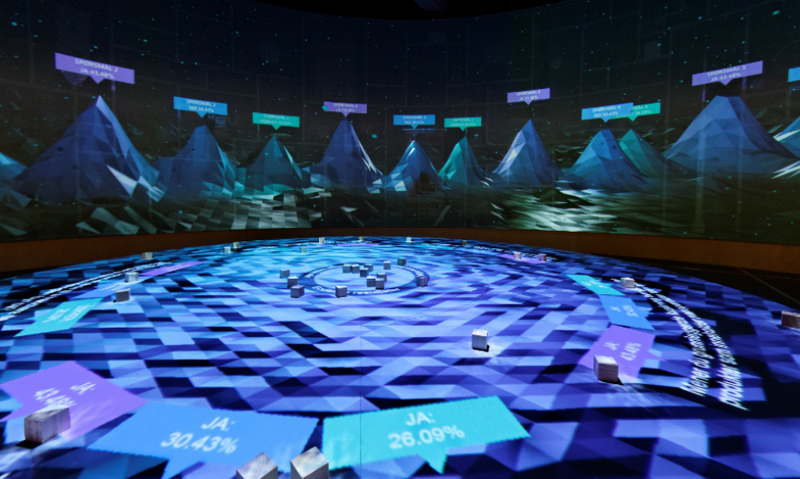 The entire TING experience reflects on the democratic process itself, and seeks to inspire in visitors a commitment to participate in ongoing debates concerning the relationship of technology to democracy. 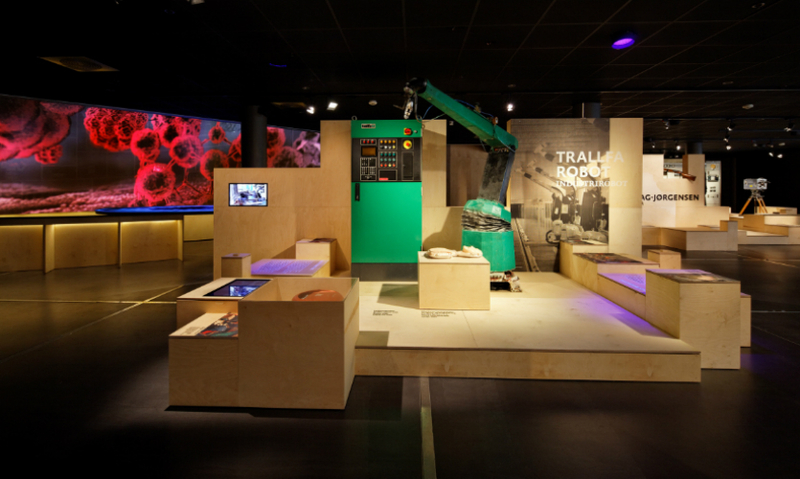 The exhibition contains ideas and technologies that to the team’s knowledge, had never been employed before. 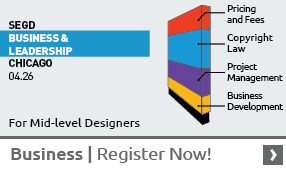 Therefore, prototyping and user group testing were critical to the design and production process. Mock-ups of various scales were built; discussion questions were developed with feedback from user groups. The role of moderators in operating the exhibition required that the museum organize and train staff and develop these special skills. Rather than explaining democracy, the exhibit design team knew that they needed to create a place where democracy could be enacted—a highly participatory experience in which the visitors play an essential role in exploring a complex premise, engage in a dialogue, debate the facts, and collectively decide an outcome. Nothing has changed more dramatically and fluidly over the past 20 years than the potential of media in service of these aspirations. 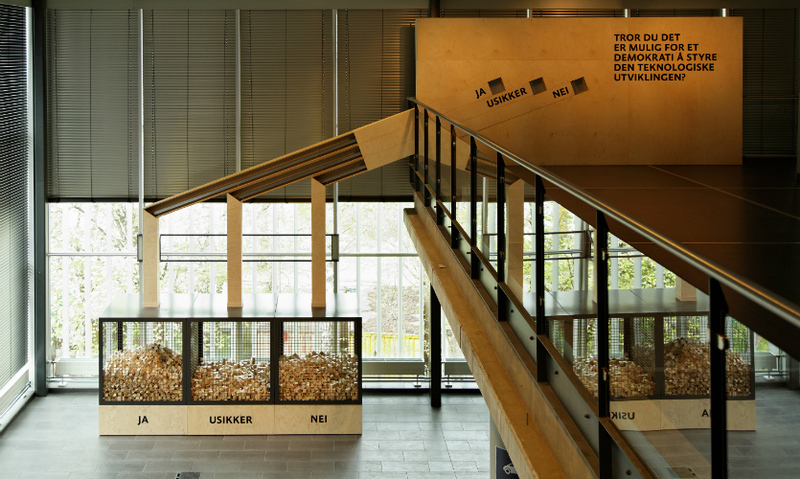 Media has become a building material as fundamental to exhibitions as wood, steel, and glass. Media illuminates: It is a light that interprets and reveals, guides and defines a pathway. Media expands access to knowledge. It is also highly effective in immersing and engaging visitors on an emotional level. 1. 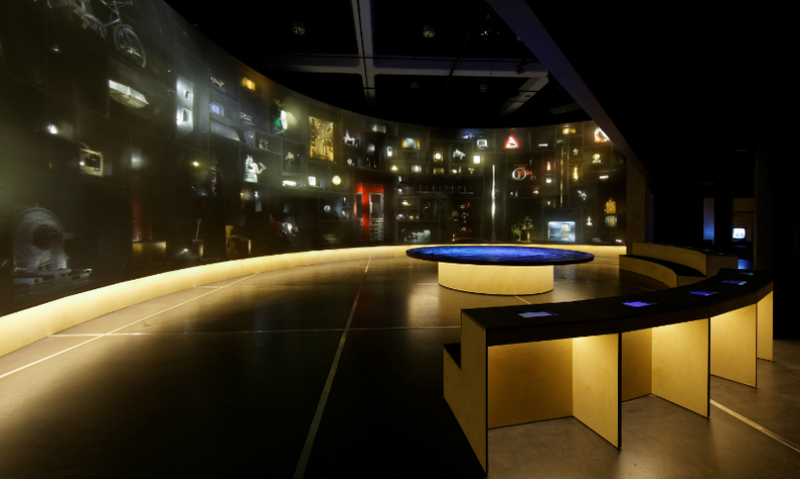 A 25-meter-wide, 5-meter-high shelf displays 100 objects from the museum’s permanent collection and functions as a 180-degree projection surface. A special semit-ransparent fabric permits the projection to overlay the objects inside the shelf. The lights in the 100 boxes are controlled via DMX and can be activated individually. Three high-end WUXGA Barco projectors (with 3D warping and edge blending to match the complex geometry of the projection surface) realize the projection. The speakers for the sound playback are hidden in the boxes. 2. The TING table has a diameter of 4 meters. 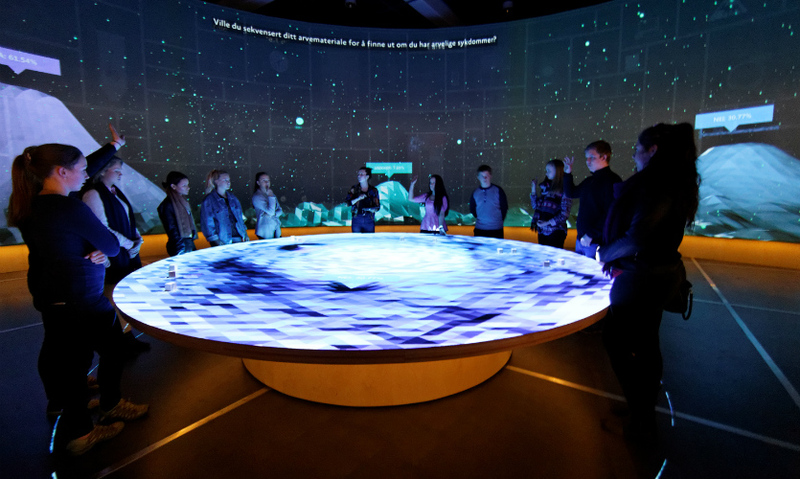 Visitors can gather around it and participate by interacting with the projected media. 3. 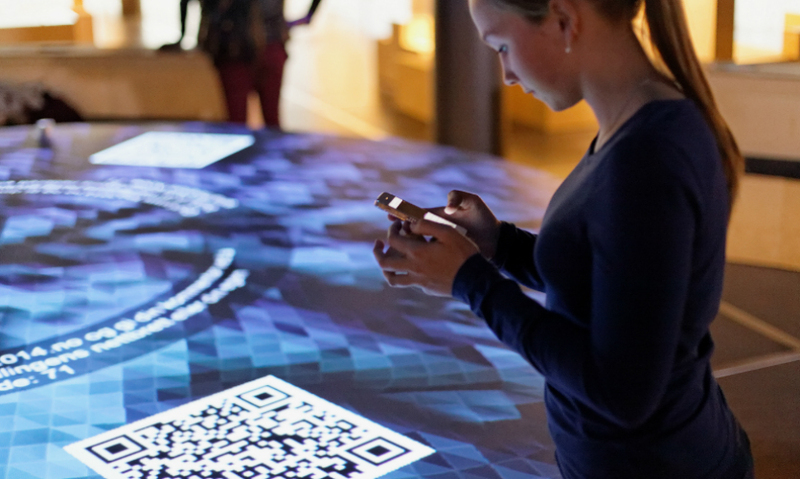 In the benches placed around the TING table, visitors can also access ten tablets that provide further possibilities for participation. The multimedia experience is divided into two parts. 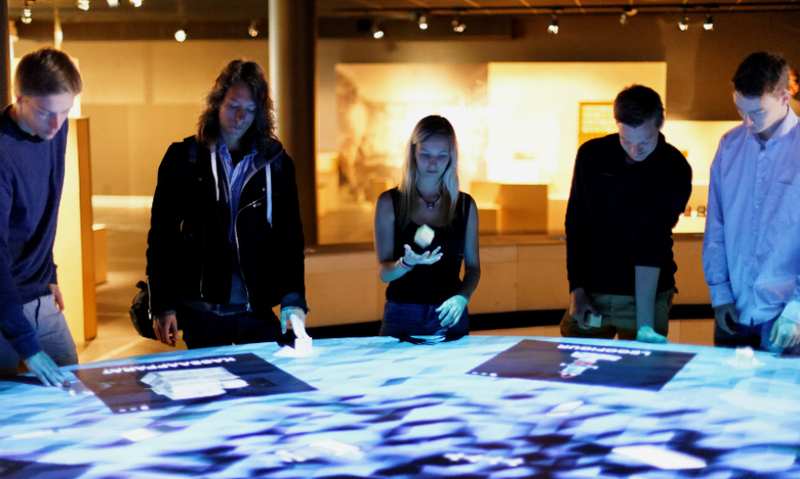 The first part of the program is the “idle” mode, which allows visitors to explore information about the 100 objects displayed. The second is the multimedia TING, which consists of a moderator-led discussion supported by linear videos and an interactive show. These high-resolution videos support the 180-degree screen. The spatial effect is enhanced by three-channel sound. The media contains documents, still images, and real-time-generated 2D and 3D graphics. So in this case, the media—even within the limited duration of this exhibition experience—stimulates social interactions and serves as a platform for authorship and for the expression of visitors’ own ideas. Response to TING has been overwhelmingly positive, as evidenced by increased visitor numbers and, perhaps more important, increased dwell time. Visitors stay longer in the exhibition and interact with each other in ways not common for a temporary exhibition.